Radiangames' Luke Schneider gives us the low-down on cracking this puzzler masterpiece. 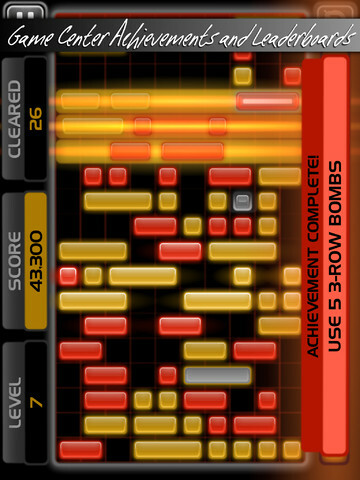 Yesterday, we reviewed Radiangames' outstanding Tetris-like puzzler Slydris. Last night we lost the entire evening to playing it. We hope to have an interview with Radiangames' Luke Schneider for you in the early part of next week, but in the meantime here are Luke's top tips and tricks for mastering this fascinating puzzle game. 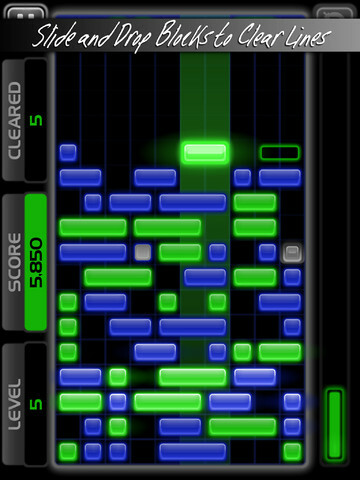 To really throw you off your game, Slydris throws some devilishly tricky blocks at you when you progress deeper into the levels. Over to Luke for the low-down on how each of these special blocks behave, and how you can counter them. To receive a Color Burster, you must clear a line of 1-color. Whatever color you clear will be the color of the Burster you receive. To then activate the Burster, you must destroy it (by clearing a row). When the Burster is cleared, all of the blocks of the same color are broken into single pieces. Other Bursters (of the same color) and Magnets become normal blocks when a Burster is destroyed. As a result, it's not a significant advantage to save up too many Bursters of the same color. If you manage to destroy Bursters of both colors in the same combo, you will get the maximum possible combo for the current blocks on the screen. In other words, you'll have at least 1 empty column when the carnage is over. Locked blocks cannot be moved left or right. But they can be broken into single pieces (with a Burster or Shatter block). Locked blocks are generally not too worrisome until higher levels, when their frequency (and size) increases. 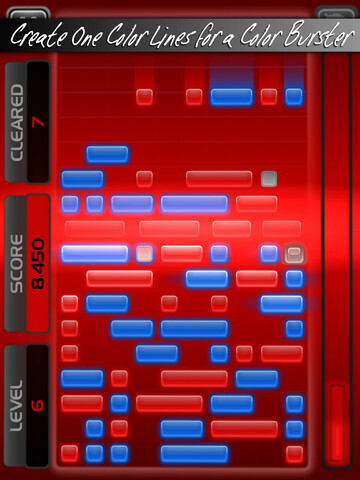 Upcoming blocks are normal blocks that grow from the bottom of the screen instead of falling from the top. You'll see a warning when one is about to appear, along with its position and size on the bottom of the screen. If you pay attention to the color of the warning message, you'll also know what color it will be. Upcoming blocks can occasionally be helpful, but more frequently they will shift the playfield in unexpected ways and can ruin the best-laid plans (if you're setting up a large combo, for instance). Note: Upcoming blocks are not seen in Survival mode. Magnet blocks will only fall once, but can be moved left or right at any time. They will "magnet-lock" into their row once blocks have stopped falling. Pay special attention to Magnet blocks, as they are very dangerous, particularly when your stack of blocks is high. - Use a 3-Row Bomb on it. - Use a Color Burster of the same color. - Land a Shatter block on it. The only "colorless" block, Shatter blocks are quite useful and always 1-block wide, especially as block widths increase in later levels. Whatever a Shatter block "lands on", or is above, will be broken into 1-width blocks. It's generally advantageous to position a Shatter block above 3 or 4-width blocks, though it really depends on the situation. Shatter blocks will negate a Magnet block, but do not affect other block types. A Shatter block has no color, and therefore a Color Burster will never be awarded for destroying a line containing a Shatter block. Destroying 10 Shatter blocks in a single row does have a significant reward, but doing so is nearly impossible. Blocks are 1-3 spaces wide, but 4-wide blocks start to appear in later levels, and blocks are generally wider the higher the level. 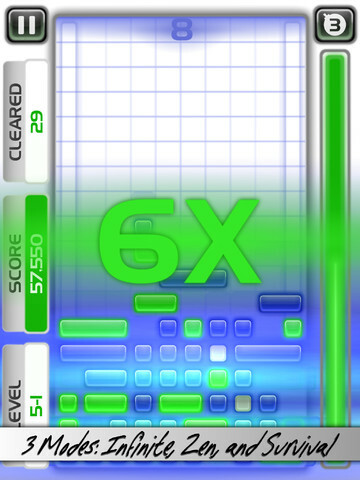 After the timer expires, 5 lines drop in levels 1-5, 6 lines drop in levels 6-10, and 7 lines drop in level 11 and beyond. It's possible to get more than 10 seconds if you manage to get the stack below 4 rows. Push the "FINISH" button that appears, and half of your remaining time (up to 10 seconds) will carry over to the next round. It's sort of like Infinite mode in terms of how blocks spawn and drop, but the difficulty is more dynamic, so you'll see more special blocks whenever the stack is low (instead of high). The background color changes for every 100 moves the player makes (instead of every level, because there are none). - Destroy 1 line of blocks for 1 point, 2 lines for (1+2=) 3 points, 3 lines for (1+2+3=) 6 points, and so on. - Destroy a 4-wide block for 1 point. - Destroy a magnet block for 5 points. - Advance a level for 5 points. - Advance a sub-level (Survival mode only) for 2 points. 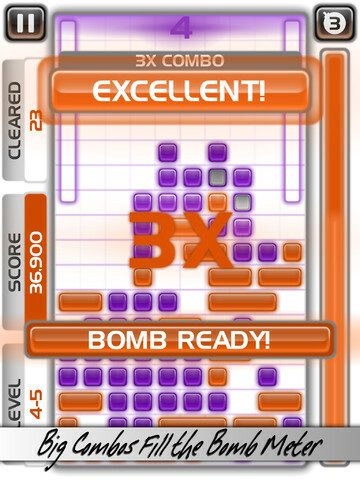 Note that whatever you destroy with the 3-Row Bomb counts for nothing (0 score, and does not fill the meter).